It looks like the tech industry is hiring more women. Maybe. Maybe not. The statistics are hard to interpret. Also, it’s unclear if the newly hired women are performing technical or other jobs. In the year ending in September, according to the Bureau of Labor Statistics, the net change in the number of employees in the computer industry was 60,000. The net change in the number of female employees was 36,000 — or 60 percent of the net change, according to the bureau’s data. Yet it does not necessarily mean that the tech industry hired more women than men. The bureau’s figure is a net change, meaning the numbers reflect new employees and those who left. More men than women probably left their jobs — because there are so many more men working in the tech industry. For example, it is possible that 100,000 men left their jobs, and 124,000 men were hired, while 10,000 women left their jobs and 46,000 were hired. If we want more women software engineers, let’s encourage girls to think like engineers. That means encouraging play that incorporates both design and construction — and in a tactile way, not only through tablet apps. 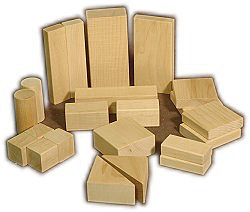 When I was young, my father chopped 2x4s and dowels into various sized blocks. Some square, some round, some rectangular, some triangles. No paint, no stain, just some sanding — and the imagination is unlocked. Today, in addition to wood blocks, construction blocks like Lego, Duplo or Megablox are what I’d give a young child, girl or boy. Bright colors are great. If there are “boy colors” like red or blue, and “girl colors” like pink and purple, I’d buy equal quantities of both and mix them together, to provide the widest possible color palette. I would buy lots of big buckets of plain old blocks, not kits where you follow directions and assemble a specific toy. That’s great for buying furniture at Ikea – but not at inspiring creativity and hands-on imagination. What do you think: Step in the right direction, a marketing ploy, or both?